R7Dinc PDC Spa Accessories * SpaWATCH MONITOR Table top or wall mounted. 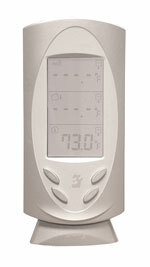 Wireless Monitor (indicator) displays spa water temp, outside and inside temp. Inside home mount or table top, up to 50 feet from spa. (See how to get it FREE!) ** Retail $77.00 -R7Dinc wholesale discount as noted plus Tax & delivery. *** PDC Promo's may include FREE SPA WATCH MONITOR at time of order. However, this offer is only valid if listed on PDC website & coupon is printed off by Client presenting to R7Dinc at time of order. NO EXCEPTIONS according to Factory.